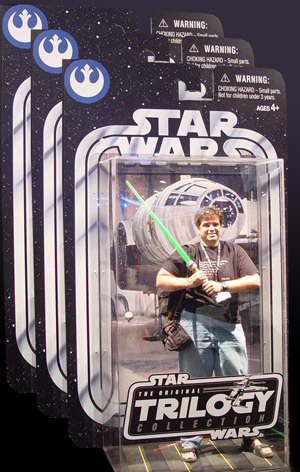 At the Con the Star Wars people had a booth where you could pretend to be an action figure. For those of you wondering what I would look like as a Star Wars toy, wonder no more. Joe Crawford blogged this at 12:19am in 2004 in July. The 27th was a Tuesday. You are reading this 15 years later. Comment. There are no comments Tweet. Send email. It has hashtags→ comic-con photos Star Wars .